Results from a new survey doing the rounds today lament the global public’s political innumeracy. But, far from being wrong at random, citizens from fourteen different countries think the world is a worse place than it actually is. No area of standard media controversy escapes our collective statistical pessimism: from immigration, to teenage pregnancy, to the ageing population, those surveyed are sure there is more, it is worse, and everyone is dying. Some of these numbers are delightfully crazy if you think about them. For example, the average estimate from the UK general public is that, in a given year, 16% of 15–19 year-olds give birth. So one in six people in a 5-year age bracket give birth annually…so, on average, almost every girl has a baby before she hits 20. Nationally. And around half of people must have guessed more than that. Would you? Really, would you?! Additionally, Brits think 24% of our population are immigrants, when actually it’s 13%. Check out how ignorant we are! And it seems that ignorance in these cases is not bliss: it’s a combination of fear and misunderstanding of percentages. Perceptions of immigration: What a mess! 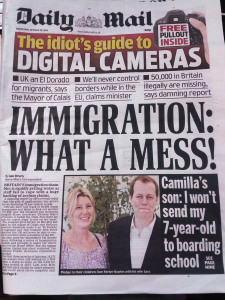 Today’s Daily Mail front page. So far, so depressing. But wait, there’s more: this litany of public misunderstanding was reported in numerous publications, including…the Daily Mail . Whilst the Mail stops short of blaming our unskilled estimation on pregnant teenage asylum seekers (who are shown in the sidebar in their beachwear), this editorial decision may nonetheless have registered on your irony meter. Oh God. What kind of country do we live in? Mummy, I know you’re only 14, but please protect me from it all! Sorry, where were we? Oh yes, that survey of topical pessimism. Clearly people aren’t answering from personal experience, because the average of everyone’s personal experience should give approximately the correct percentage. (This is due to maths.) So could people be guessing based on fear and prejudice? And where might that have arisen? We don’t know but, as the Mail ’s headline writers clearly do know, implication is a powerful tool. We’ll let you draw your own conclusions. Just as a friendly warning, those conclusions are probably numerically inaccurate. To those lucky enough not to have been following this story since its bitter beginnings, Samantha Brick is a woman. She wrote an article for the Daily Mail on Tuesday, complaining that other women hate her because she’s too beautiful. The utter irrelevance of the piece, the galling arrogance of the idea, and Ms Brick’s failure to meet the standards of ‘beauty’ for many readers was a red rag to a platoon of bulls. The page was inundated with comments, and thus was born a temporary mini-phenomenon for both traditional and social media. The self-parody alert apparently hasn’t gone off at Daily Mail HQ. Or maybe it has, and someone pulled the wires out and stamped on it a few times because the sound it made was just too beautiful for human ears. Even seasoned press disparagers are watching the continued apparently-uncontrolled-but-possibly-self-aware tailspin of the Samantha Brick non-story with a kind of pinch-nosed amusement so, apart from the fact that we’ve not linked to the story directly, they’ve won. The Daily Mail have found the winning formula. They’ve created a totally bizarre perpetual motion machine of a story that runs entirely on its own perceived notoriety, regardless of the number of meta- prefixes required to explain the situation. I might be wrong, but I think we’ve become meta-meta-meta-interested, in that the most interesting aspect is that meta-meta-interested parties (who recognise the cheap ad-revenue-maximising strategy being employed) still go back for more. If that interests you, it’s time to get a job in a philosophy department. Or at the Guardian . The Daily Mail is collapsing into an event horizon of navel-gazing recursive reporting which threatens to engulf Twitter, Fleet Street and, shortly, the entire western spiral arm of the galaxy. And, when half of the Milky Way is torn asunder as an indirect result of them, I think we’d all be justified in hating Samantha Brick for her looks.